Hi there! I'm Azagen Mootoo (Host Intruder) from Mauritius island, graduated with a BSc (Hons.) in Computer Science with Network Security at the University of Technology, Mauritius. I am now working as a software engineer at Accenture. I have previously worked as a chat moderator at Mauritius Multimedia Services Limited. Usually, when I'm not in front of a computer, I'm off biking, playing football, watching TV, going out with friends, reading and planning to conquer the world. When I am in front of the computer I'm generally surfing the net, blogging, listening to music, engineering solutions, building open source hardware and software projects and having fun playing with codes and scripts. January 2016: As from now all my websites are HTTPS enabled to protect the integrity and confidentiality of users' data. 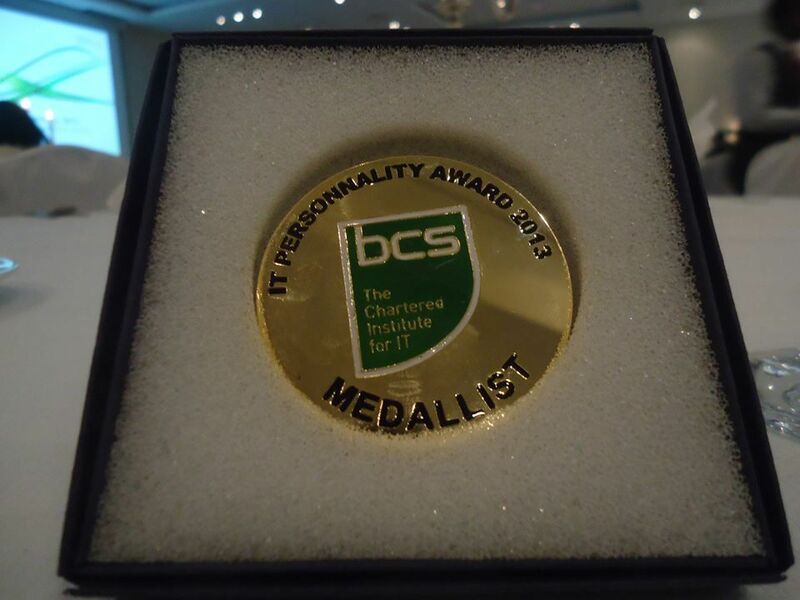 October 2013: Nominated Medallist for the IT Personality Award 2013 by BCS (British Computer Society), The Chartered Institute for IT on 5th day of October 2013. August 2013: Nou5 is a free and open source application that enables you to effortlessly update your contacts with regards to the forthcoming 7 to 8 digits Numbering Migration planned for all mobile networks in Mauritius as from 01 September 2013. January 2013: ABAP Cookbook contains a large collection of free premium ABAP tutorials. Over there, you will find useful SAP ABAP tips and tricks and latest SAP news. 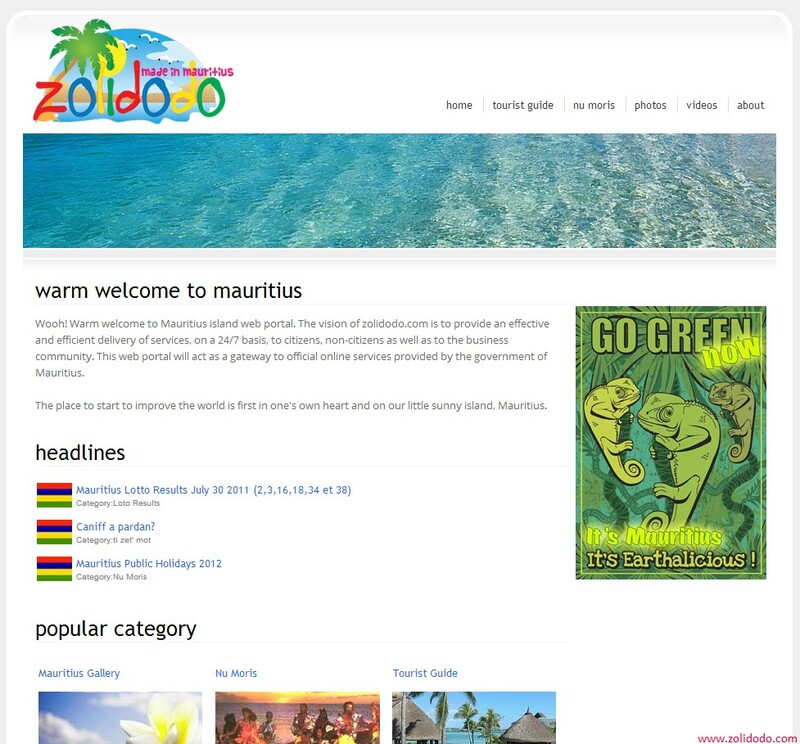 December 2012: An desktop/mobile/web application to help people save energy in Mauritius. December 2012: MoCinema, a mobile app. which will provide a guide of movies currently being played in Mauritius cinemas. 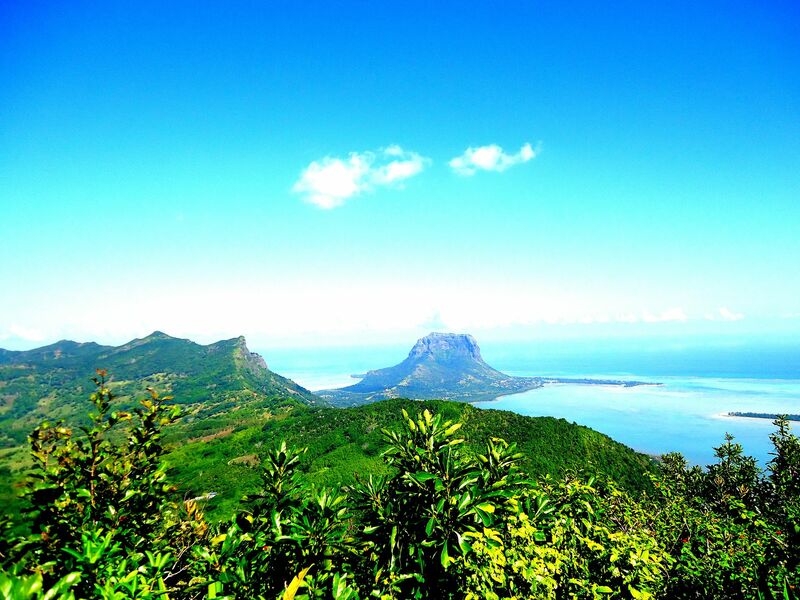 September 2012: A website with funny Mauritian jokes and puzzles with the aim to give the readers a little smile. August 2012: A website to excite the white matter in our brains. April 2012: Expert Forward Ltd. is a Mauritian based firm which strives for honesty, integrity, leadership and professionalism. Our main goal are to deliver affordable, high quality “tech” solutions to small and medium enterprises and to help in building a better Mauritius Island. October 2010: A PHP script to tease your friends by sending them anonymous mail. The script was pull offline in November 2011 as the mail server was bouncing back some of my real mails. September 2008: Free the internet with m0pr0xy. A script which acts as a US proxy and can be used to bypass blocked websites. Sadly :( this little script was removed in 2012 because some online security scanners were classifying my website as security threat. June 2008: A little web portal for our little sunny island. May 2008: Personal blog where I generally post about latest IT trends, linux, network security, programming and among others. However, the blog is outdated now. 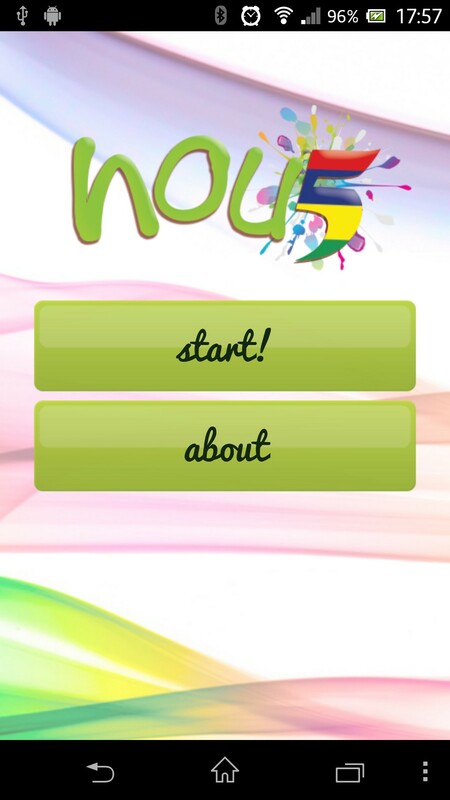 Nou5 - Android Open Source Mobile App. 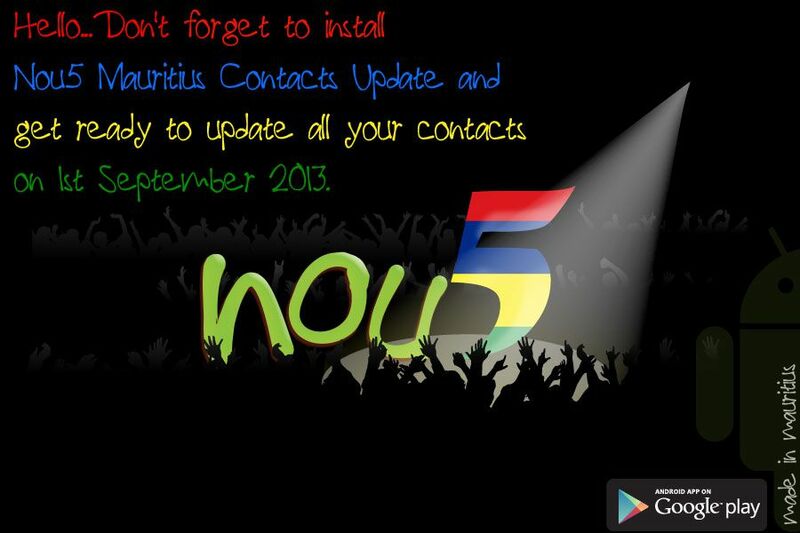 Nou5 is a free and open source application that enables you to effortlessly update your contacts with regards to the forthcoming 7 to 8 digits Numbering Migration planned for all mobile networks in Mauritius as from 01 September 2013. With just 2 clicks, all applicable phone numbers in your contacts are automatically updated. The application has been downloaded more than 30,000 times in Mauritius. 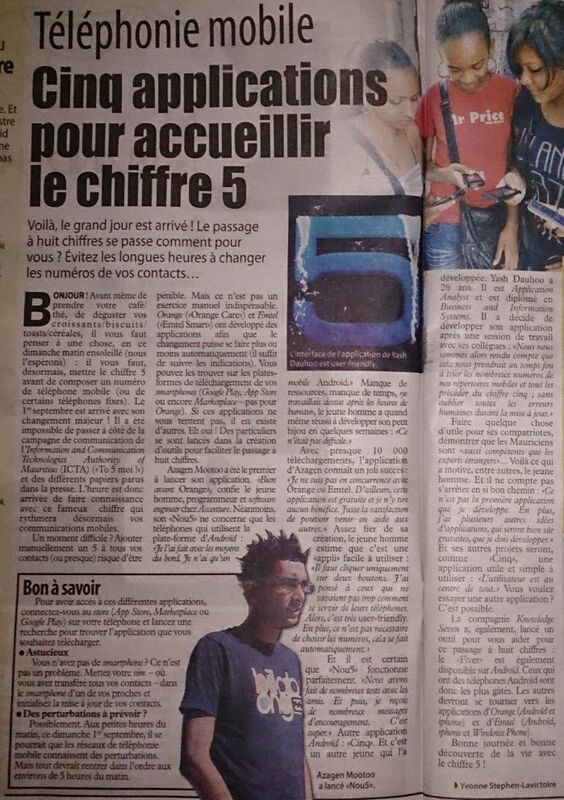 Nou5 has received positive feedback from the community and has even been featured in local newspapers. 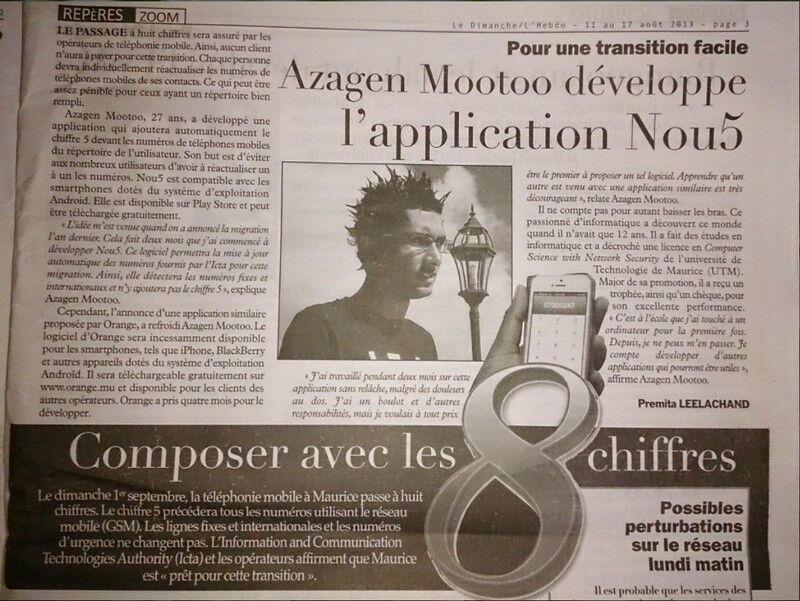 An article on Nou5 was published in the Defimedia Group newspaper. Other articles on Nou5 were published in "Le Dimanche/L'Hebdo" and "5Plus Dimanche" newspapers. The vision of zolidodo.com is to provide an effective and efficient delivery of services, on a 24/7 basis, to citizens, non-citizens and the business community. The web portal will act as a gateway to official e-services provided by the government of Mauritius. I have pull the plug in 2015 as the website needs a revamp UI. I will work on a completely new responsive UI that once I got some spare time. The conception of Brainteaser Bay logo. In November 2012, Brainteaser Bay won the Dreamhost Site of The Month Award for content and originality. Brainteaser Bay is one of the top brain teasers websites. Success! :) Your message has been sent to Azagen. Oops! There was an error sending your message. Please try again or you can just write me a mail on hostintruder@gmail.com. Address: Located somewhere in the contrast of a multitude of colours and tastes of the island, Mauritius, set in its turquoise sea, the oasis of peace and tranquillity. Ohh! I'm retrieving the tweets! This is the place you can learn more about what I’ve been up to. Have a look at the experiment section to have an idea of some of the things I’m passionate about. Please don’t hesitate to drop me a message if I can help.